Size: 1 1/4" x 1/3"
This is on my wall. Whats going to hatch? When?? I can't wait. 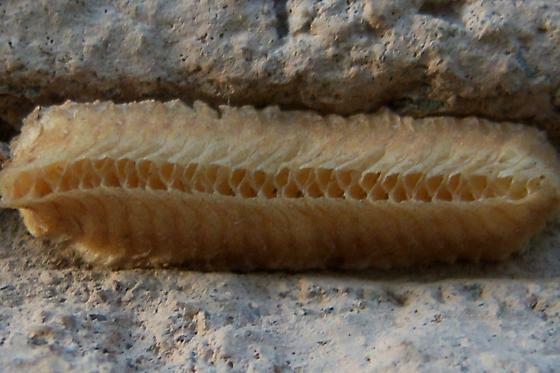 This is the egg case of a mantis, possibly the Mediterranean mantis, Iris oratoria, but I'm not positive. Would 'hatch' next summer I imagine, though I wonder if those are not emergence holes down the center, in which case it has 'already' hatched. Yes, it is an ootheca of Iris oratoria and it has already hatched.